A planning application has been submitted for a new a drive thru café / restaurant on land close to the Advanced Manufacturing Park (AMP) in Rotherham. 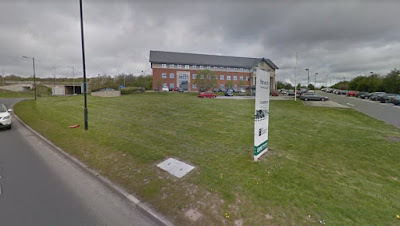 EOS Inc Ltd, which shares directors with Rotherham-based development firm, Harworth Group plc, has put together proposals for a 2,200 sq ft development on land adjacent to Harworth's Advantage House building on Poplar Way. Harworth Group, the brownfield regeneration specialist that was created out of UK Coal plc, acquired the office block near to its flagship Waverley development for £2.2m in 2016. A second office block on the site was proposed back in 1996 but never built. Now outline plans have been drawn up for a proposed drive thru unit which is likely to form a single storey unit, although a maximum of two storeys is proposed. An operator has not yet been revealed. An access road is already in place to Advantage House and 31 parking spaces are included in the plans, as are proposals for a new crossing and an indicative landscape plan. The land is identified for business use in the recently approved Local Plan but applicants state that it is no longer viable for employment use as it would need to compete with the nearby Advanced Manufacturing Park (AMP) and Sheffield Business Park. The applicants add that the loss of employment land would have little affect the borough's plans for economic growth. As it is an out of centre site, a sequential test is included in the plans in line with "town centre first" national and local planning policies. Sequential tests ensure that development is located in the most sustainable location first (usually in town centres), before other, less sustainable locations are chosen. The test concludes that there no sequentially preferable sites, discounting sites in a number of centres located within Rotherham and Sheffield. The application, drawn up by Barton Wilmore, concludes: "The site will bring benefits to all three strands of sustainable development, economically, environmentally and socially by creating new job opportunities, provide additional facilities for the local area and develop a piece of underutilised land. It also supports and complements the wider plans for growth within the Sheffield-Rotherham corridor." Harworth is working on a joint venture with Dransfield Properties on a new retail mixed use development on the Waverley site. Its other developments, such as Logistics North near Bolton and Gateway 36 in Barnsley, have Costa Coffee units alongside commercial space.